Historically, my taste in beaches runs heavily towards the remote, deserted and preferably accessible only by precariously muddy cliff paths, but there is a place in my heart for a good promenade, flat golden sands and the easy availability of really good ice-cream. Bournemouth, in March, on a weekday, fulfils most of those criteria, and had the added advantage of being virtually deserted, populated as it was by dog walkers, runners, people reading books in their cars, our crazy little sandcastle-building family, and a few beach hutters, blasting out the cobwebs with a shot of sunshine. 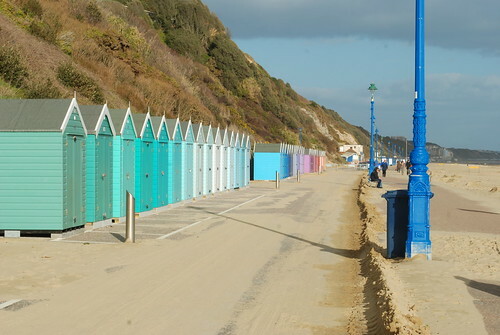 I promised to tell you about the oh so pretty rainbow beach huts (and they are worth the wait), but even the simpler red and blue huts, terraced up the cliff from Boscombe Pier, have an inherent appeal. 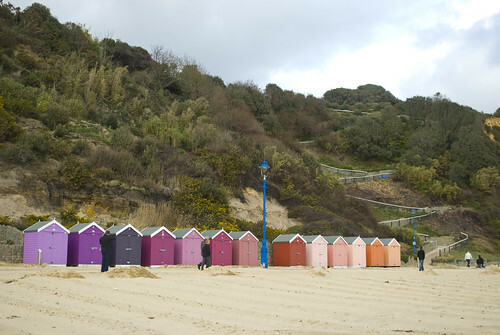 Part of it is the practicality; a place to change wet cozzies, store surf boards, and rustle up hot chocolate after a spring swim is deeply attractive to anyone who’s ever performed the towel quick change act on a crowded beach. But I think it’s more than simple practicalities, it’s playing wendy houses for grown ups, in a really good way, with little camping gas stoves and without low ceilings to bang your head on when you grow too tall, and just the right quantity of spiders to catch any moths with funny ideas. 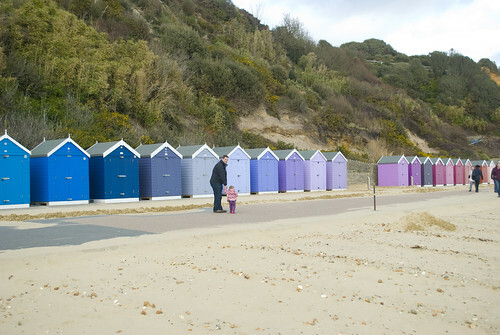 You could have so much fun decorating a beach hut, and arranging and rearranging the tiny space until it had everything you needed (in beautiful colours of course), and not a jot more. Really comfy deck chairs that folded away neatly for starters, and a camping stove with a kettle (for hot chocolate) and a frying pan (scrambled eggs and bacon butties), and either some enamel mugs and plates or some plastic ones in the exact same shade as the hut. Of course there would be lots and lots of spare towels, and blankets and quilts made from hardy upholstery weight fabric to cope with the levels of sand abuse, and perhaps a pillow for little people naps (and who would complain if it were borrowed by the occasional big person). 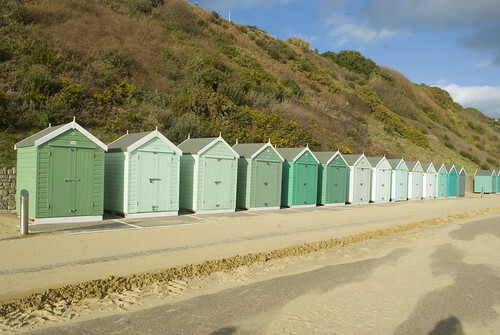 Surf boards go without saying (Boscombe has an artificial reef so surf on the south coast isn’t quite as far fetched as it sounds), and hooks on the walls could hang crenellated buckets and sturdy spades (wooden handles a priority). A big jar for sea glass, and another for shells and other treasures on a shelf at the back above the stove, and in the middle, a big sturdy cake tin for explorer’s provisions. On the shelf above (in watertight boxes), sketch books and pencils, the Swallows and Amazons paperbacks, and an emergency ball of sock yarn, needles and notions to pass the time between lunch and the next swim and stay out of the heat of the sun. Hidcote Lavender (followed by Dairy Milk) to Orangery. (And yes, I do have the Farrow and Ball paint chart as bedtime reading!). 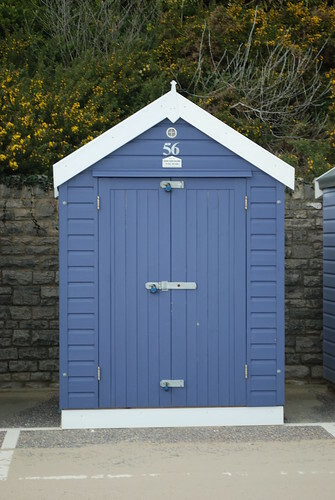 Pitch Blue according to Farrow & Ball, and far from the liveliest colour of the bunch but it does make the gorse in the cliff behind really pop, and the white flashing and grey roof contrast beautifully. 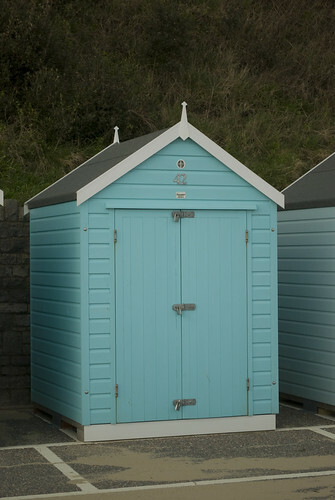 Number 42 is softer, a calm respite from the storm of the ice-cream queue perhaps. F&B haven’t got a paint to match (surely an oversight on their part) and I rather hope they develop one, just because I find it soothing. I’d paint a panel in it and hang it on my partition wall at work to make me terribly calm and efficient. 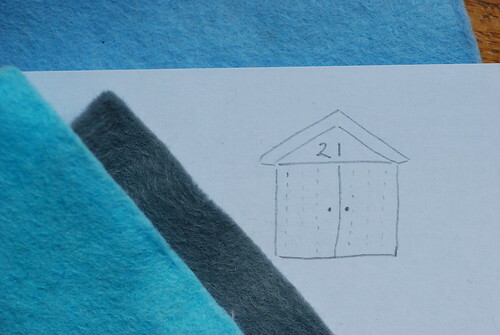 I’m storing up all these pictures as inspiration for a rainy day, and a little beach hut mania seems to be catching as I discovered that I had completely inadvertently left off doing the ironing, in favour of playing with my collection of felt squares and a little sketching. 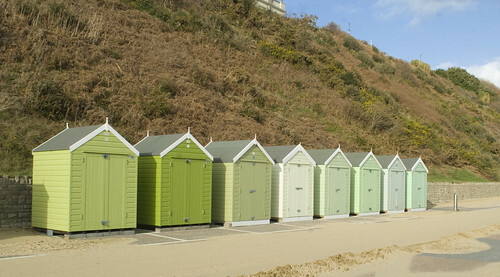 PS – if anyone else is seized of a sudden desire to beach hut, the ones in the picture are on Bournemouth East and appear to be available to rent here – though whether they are the rainbow ones or some more pedestrian red and blue ones or whether they have any availability this side of the next century is unknown. 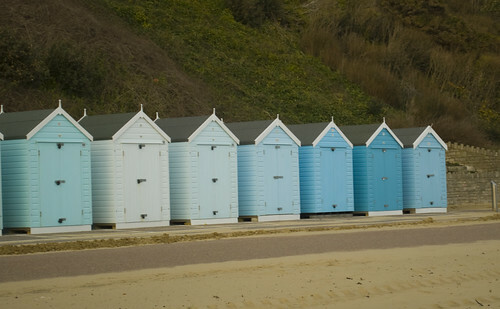 And roller skates to skate between piers, and a bead curtain made from a rainbow of glass beads to keep the insects out of the hut, a kite for windy days and emergency tins of baked beans with sausages in store for hungry days. I would also have a fridge, beer and bunk beds, but I would have to win the lottery. 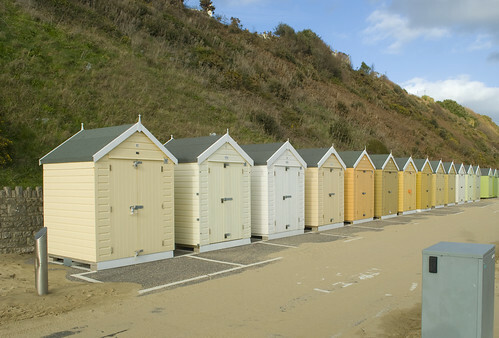 Mudeford have some nice beach huts that you can sleep in, I think they start at 120 thousand. I would choose a cream one, the one on the end would be very nice.